Find out more about Seattle Business Babes. Take your Instagram to the next level for your business. If you’re wondering what the best practices are for Instagram for your business in 2019, this is the workshop for you! In this workshop we’ll cover the basics of using Instagram for business and show you how to plan, manage, and optimize your Instagram strategy. We'll go over hashtag strategy, best posting habits, incorporating video, the use of stories and how brands are using it to amplify their mission and also do research, the algorithm, writing compelling copy, and defining your target audience! Be prepared to learn and deep dive into your Instagram strategy throughout the workshop, along with do hands on tactical work! You don't want to miss out! *In order to provide the best value and be able to answer as many questions as possible, there will only be 20 tickets available to this workshop. You're invited to our One Year Anniversary Bash! Join us on January 31st at The 101 from 6pm-9pm for #SBBturns1! We have had such a blast with each and every one of you this past year and we cannot wait to continue growing and to show you what we have in store for 2019, but first...let's party! Join us for our first South Sound event! We get that traffic is a nightmare but we want to help as many women as we can with their business, networking, and learning! SO, we're coming to you once every quarter with our workshops, panels, and more! We're better when we work together! What does it mean to cultivate a community and how can we continue to show up and help other women with collaboration instead of competition! Let's kick off this summer the right way! We would like to invite you to our Summer Night Networking Party! Join us this Thursday, July 26th 6:00pm for a night of tips on how to network both online and offline, incredible connections, vendors, prizes, food, and drinks and much more! Partial Proceeds will be going to Washington State Coalition Against Domestic Violence an incredible organization that I hope you will take time to learn more about! What does it mean to grow a Healthy Business? So often we want to do it all but can't seem to find the right balance between work and life. Join us for a night of inspiring speakers, local vendors, treats, refreshments, prizes, and incredible connections! Venue: General Assembly Seattle - offers programs in web development, data science and analysis, UX design, digital marketing, product management and more. Networking is the key to business success and we get that it can be scary! But don't worry babe, we've got you covered! 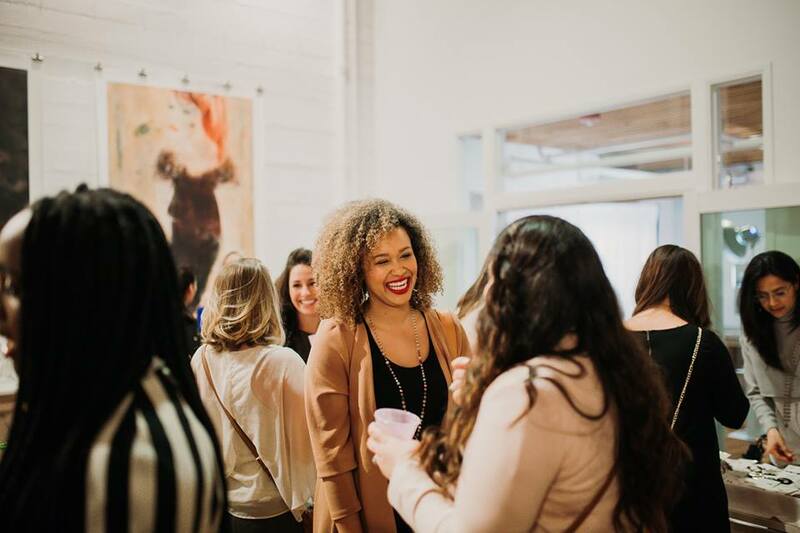 Join your hosts Alisha Kumar and Danielle Wiebe for a fun and inspiring evening celebrating the launch of Seattle Business Babes. We will enjoy wine, refreshments, mingling, vendors, an inspiring panel, and prizes! Guest Panelist: Desiree Sigfried, founder of Desiree Hartsock and author of 'My Fairytale Wedding' You may also remember her from a popular reality TV series the Bachelorette. Desiree is married to Chris Siegfried and is also a Mompreneur raising her little boy Asher. Who should attend: This is an opportunity for business owners, bloggers, creatives and aspiring business women to meet other local Seattle entrepreneurs. This is also an opportunity to connect with us to see how you can be involved in our community! We SO look forward to meeting you! If you are interested in Vendor + Sponsor opportunities, click here. ps. Join us on Instagram @seattlebusinessbabes so we can connect with you!